The ides of April: the day was sunny and the night was nice and the presence of a band as surreal as the weather of Montreal itself brought enlightenment at the stage at La Sala Rossa. 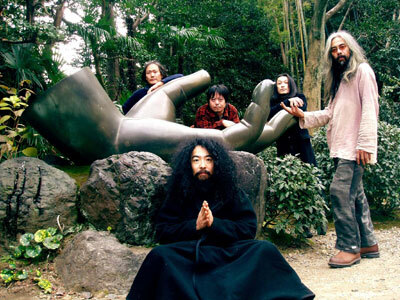 Coming from the mystical depths of Japan and playing music unlike any other, Acid Mothers Temple’s performance could genuinely be described as a masterpiece of psych. TJUTJUNA kicked the night off to an electric start with a sound that was just as morphed as their name. Their set was incredibly tight, with perfect co-ordination between the band’s two drummers and the guitarists. The use of other digital sounds was very well placed and if you didn’t get their music, your ears are missing out. Everyone was completely taken from the moment Acid Mothers Temple arrived on stage. It wasn’t long before the quartet of veteran Japanese musicians transformed into true sonic magicians, streaming long white hair and all. The music erupted suddenly and deeply, and it could’ve summoned mythical creatures in the distance with its unearthly force. The images and thoughts running through one’s mind upon hearing them sing were all choreographed by the will of the band. Their music was equal parts original, theatrical, and artistic. Never has psychedelic rock been so hypnotic. Acid Mothers Temple is a completely unique band and the crowd that night was a true witness of it. Everyone was shaken — in the best way possible — and thrown into a new state of awakening. It was a great show, even though I did not understand a single word the band spoke the whole evening. This entry was posted in Events, Reviews on April 19, 2013 by admin.